Putin knows where Russia’s real threats lie. In this Monday, Sept. 28, 2015 file photo, U.S. President Barack Obama, right, and Russia’s President Vladimir Putin pose for members of the media before a bilateral meeting at the United Nations headquarters. Credit: Sergey Guneyev/RIA-Novosti, Kremlin Pool Photo via AP. “Why a new Cold War with Russia is inevitable,” read the headline from the Brookings Institute article last week. “This is not a new cold war but something more dangerous,” stated the headline in the Financial Times. “It’s Not a New Cold War, It’s Worse,” echoed the headline in Commentary. Cold War talk has been heating up over the last year, spurred by Russia’s belligerence in Ukraine and its absorption of Crimea. With Russia’s dramatic swoop into Syria last month, followed by a Russian general’s steely demarche to the U.S. to vacate the area, the dread has escalated, as if the dark days when the world feared all-out nuclear war could return. Everyone should chill out. We aren’t approaching a new Cold War, not by a long shot. Let’s stipulate that America’s foreign policy has been feckless, that the U.S. upended a relatively stable Middle East through the ouster of Egypt’s Mubarak and Libya’s Gaddafi, and attempted ouster of Syria’s Assad, that America’s allies feel betrayed, that the U.S. and the West are now in retreat in the Middle East and elsewhere, and that Russia has, as critics of American foreign policy bitterly say, opportunistically moved in to fill the vacuum. 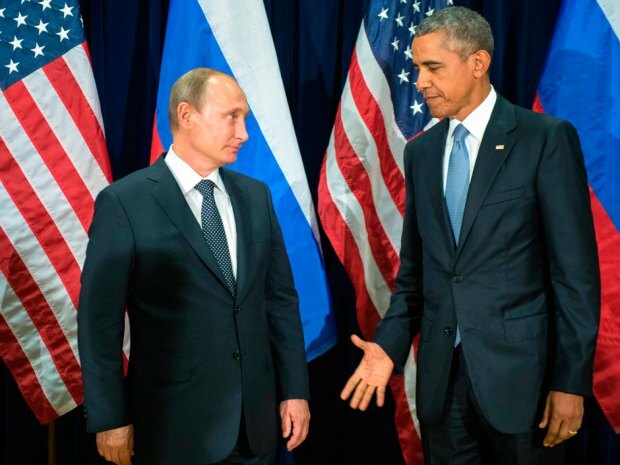 Let’s agree, as the critics also say, that Putin plays chess while Obama plays checkers. Diplomatically damaging? Yes, even humiliating. Economically harmful too, since Putin is increasing his leverage over energy supplies upon which Europe and others rely. But militarily dangerous? No. If anything, given the West’s reluctance to engage its enemies, the West is safer by virtue of Russia’s now-muscular presence in Syria. Unlike the Soviet Union, which promulgated a Communist ideology attractive to many in the West as well as much of the Third World, Putin’s Russia is nationalistic and inward looking, bereft of any grand theme that non-Russians would rally to. Russia today is in no way a competitor for the hearts and minds of the peoples of the world against either Western-style capitalism, Chinese-style authoritarianism or Muslim-style jihadism. Neither is Russia seen as an economic model for the world, let alone an economic powerhouse, unlike the Soviet Union, which many believed to be economically ascendant until its collapse. A Cold War implies a stand-off between two super-powers in a bipolar world. There are no super-powers in today’s multi-polar world that the rest of the world will be pressured to align with. Russia and the U.S. are merely antagonists, wrangling over territories at the fringes of their spheres of influence, with Russia understandably peeved at American attempts to alter the status quo – Ukraine and Crimea have for centuries been in Russia’s sphere, Syria since the Second World War. Russia is less trying to expand her sphere of influence than to keep what has historically been hers. Although Russia’s move into Syria has humiliated the West by exposing its feebleness, consider the alternative. Without long-time ally Russia to prop him up, Syria’s Assad would have had no choice but to rely entirely on Iran – the Middle East’s ascendant power – to salvage his rule against the Sunni forces arrayed against him. Iran, a Shiite nation, would then have had the whip hand in its quest to control the nations of the Middle East, to the consternation of all the non-Shiites – Sunni nations such as Saudi Arabia, Egypt and Jordan; the Jewish nation of Israel; the Christian communities in Syria, which Assad had protected; and Syria’s ruling Alawite minority, which Shiites have historically deemed heretics. With Russia imposingly on the scene, Iran would lose total mastery over Assad. Iran’s wider ambitions would also be constrained since Russia has good relations – both military and trade – with several of the region’s powers, including Egypt, Saudi Arabia and Israel. A constrained Iran – which is building intercontinental ballistic missiles to reach the West, and which already has terror cells stationed in the West – very much suits the West. Putin is doubtless enjoying rubbing Western noses in the dirt – this is payback for the West’s economic sanctions against Russia over Crimea, and payback for what Russians generally perceive as gloating by the West after the fall of Communism. But Putin knows where Russia’s real threats lie – economically, if he’s unable to control energy markets, and militarily, if he’s unable to control Islamic fundamentalism. A Cold War with the West, which serves neither interest, is off the radar.